Charles De Gaulle’s return to Paris ushered in the restoration of his nation’s honor in a post-war world. In Mid-August 1944, Paris was in tumult. The French 2nd Armored Division rolled into the City of Light on August 25 and ended four years of harsh Nazi occupation. A great parade was set for the following day to celebrate France’s deliverance. Foremost among its participants was to be General Charles de Gaulle, leader of the Free French movement and the soul of the broken nation during its darkest days. As the parade commenced, a million people lined up around the Champs Élysées. A rather tall de Gaulle was flanked by prominent associates and others who had fought and bled for this much-anticipated occasion. 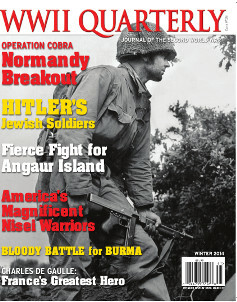 In “Deadly Cobra Strike,” you’ll learn about Omar Bradley’s Operation Cobra, and how it propelled U.S. forces into open ground across France. In “An American College Goes to War,” Patricia Overman looks at Beloit College, one of 150 schools that hosted the Army Air Force’s Cadet Training Program from March 1943 to March 1944. In “The Admin Box 1944,” William Allmon compares the tested tactics of the Japanese, as applied to the Battle of Midway and beyond, with the long experience of the British armed forces. In “America’s Most Decorated Heroes,” you’ll learn all about the harsh discrimination endured by many Japanese Americans during the war, and how many joined the U.S. military to prove their loyalty despite their endured hardships. In “Ninth Air Force Captured in Brushstrokes,” you’ll find artist Milton Marx’s beautiful chronicle of the Ninth Air Force preparing for the Normandy Invasion and beyond. In “Wildcats Ashore!,” Nathan Prefer takes you inside the desperate fight for Angaur Island, a tiny piece of Pacific real estate, and its brutal role in the united war effort. In “Hitler’s Jewish Soldiers,” you’ll read about the many relatives of German Jews who, willingly or not, fought for the Third Reich. “The Lost DUKW of Lake Garda” takes you into the exhaustive search conducted by the Voluntari del Garda for the last casualties of the 10th Mountain Division. What do you think about de Gaulle’s return to Paris in August 1944? What details did you learn after reading “In Desperation and Triumph”? Let us know in the comments below. Tags 10th Mountain Division, Angaur Island, armed forces, Battle of Midway, Charles de Gaulle, Features, France, Gaul, general, General Omar Bradley, German, Japan, Japanese, military, Milton Marx, Nazi Party, Normandy Invasion, operation cobra, Pacific, Pacific Theater, South Pacific, Third Reich, U.S. Army Air Corps, World War I, WWI, WWII.